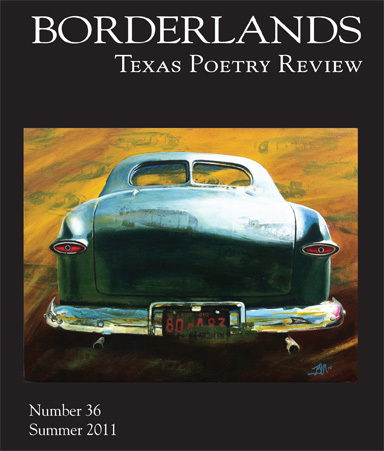 Paintings of vintage car rears will be included in the next issue of Borderlands – Texas Poetry Review. The launch of the publication will begin with events taking place in Austin TX on July 23rd at Clive Bar and continuing Saturday night at St. Vincent de Paul’s Vintage Boutique and Thrift Store. Paintings will be on view at both locations along with live music performed by Sean O’Brien and select poetry readings (readings at Clive Bar only). Edited by Judy Jensen, Borderlands’ upcoming summer issue features poetry, reviews and an art series, ‘Rear View’ paintings of vintage cars by New York-based artist Gwendolyn. Poets featured in the new issue include Joe Ahearn, Marian Aitches, Malachi Black, Jenny Brown, Cyrus Cassells, Patrick Ryan Frank, Lyn Lifshin, Katherine Durham Oldmixon, Phil Pardi, Leanna Petronella, Roger Reeves, JeFF Stumpo, Scott Wiggerman and Laurie Saurborn Young, among many others.